Gabriel Baker was born about 1750 and married Hester Toogood by licence on 28 March 1779 at Sherborne. They had three children; Susanna born 1776, James born 1781 and Elizabeth born 1783. Gabriel was noted "of Yeovil". Gabriel Baker was elected Churchwarden and served in 1782-83 and again in 1800-01. Gabriel was listed as a Mercer and Draper in an advertisement in the Western Flying Post in 1779 and in the same year the publication listed him as a Mercer, Draper and Undertaker. He was listed as a Linen Draper in the Universal British Directory of both 1790 and 1791. A deed of 1804 noted him as a Mercer. He would later be noted as a Chapman (a Chapman was a Mercer who would invest in the raw materials of the cotton, woolen or silk trade, put out the work to spinners and weavers at home on piece-rates, and sell the product for profit). The Land Tax Redemption Register of 1798 noted that Gabriel owned at least two properties in Yeovil; the first, with an assessed annual value of £2 3s 2½d (about £2,500 at today's value), was occupied by William Cayme while the second, assessed at 9s 0½d, was occupied by a Mr Hambridge. He was also Yeovil's Postmaster, presumably having taken over the position from the previous incumbent, Postmaster Hobbs, probably around 1790. 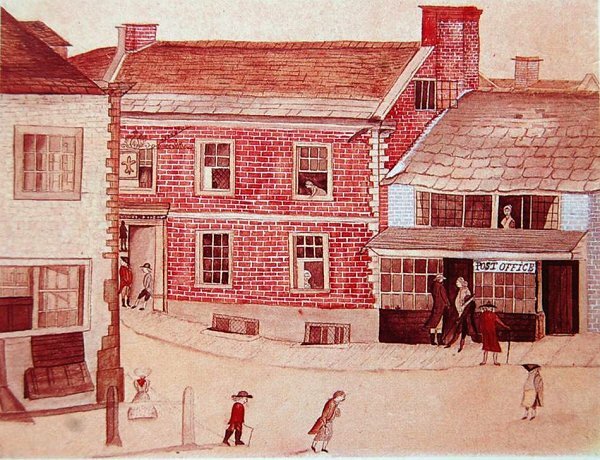 At this time Yeovil's Post Office was in High Street, where Beales' store now stands, and is shown in the painting below. According to Daniel Vickery, writing in 1856 “The postal arrangements of the town are very good. The Post Office was kept for many years by Mr Gabriel Baker, who was Postmaster, and lived on the premises now occupied by Mr Raymond, as a china shop, then a low pent house, with a thatched roof (clearly not from the illustration below). Mr Baker was succeeded by the father of the present postmaster, Mr Jennings, who removed it to its present position (in Silver Street)". In 1804 the following entry was made in the Churchwardens' Accounts Book and caused some controversy "I Wm Phelips Vicar of Yeovil do nominate & appoint Mr Gabriel Baker as My Church Warden of the Town of Yeovil for the year ensuing. April 3rd 1804" signed Wm Phelips. To which, on the same date, the Vestry members replied "The Town do appoint the same time George Watts and Henry Collins and Consider the Above Nothing As there never was such Entry before." and they later continued "There never was any such entry in any of Yeovil Church Books before therefore its Considered as Nothing for the Vicar Has No Right Whatever to choose a Churchwarden." Unfortunately things were to get worse for Gabriel. On 13 February 1812, according to the British Postal Service Appointment Book, Gabriel Baker was dismissed from his position as Postmaster and ironmonger Robert Jennings became Yeovil's Postmaster. Shortly afterwards things would deteriorate more rapidly for Gabriel, as reported in the London Times "The Commissioners in a Commission of Bankrupt, bearing the date the 8th day of April 1812, awarded and issued forth against Gabriel Baker, of Yeovil, in the County of Somerset; Mercer, Draper, Dealer and Chapman, intend to meet on the 22nd day of March next, at Eleven o'Clock in the Forenoon, at the Mermaid Inn, in Yeovil, in the County of Somerset, in order to make a Dividend of the Estate and Effects of the said Bankrupt; when and where the Creditors, who have not already proved their Debts, are to come prepared to prove the same, or they will be excluded the Benefit of the said Dividend. And all Claims not then proved will be disallowed." Even the Salopian Journal, as well as the Edinburgh Gazette, noted the bankruptcy of "Gabriel Baker, of Yeovil, Somerset, mercer." 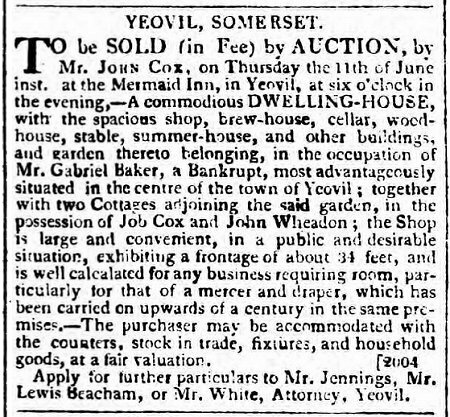 TO be SOLD (in Fee) by AUCTION, by Mr. JOHN COX, on Thursday the 11th of June next, at the Mermaid Inn, in Yeovil, at six o'clock in the evening, - A commodious DWELLING-HOUSE, with the spacious shop, brew-house, cellar, wood-house, stable, summer-house, and other buildings, and garden thereto belonging, in the occupation of Mr. Gabriel Baker, a Bankrupt, most advantageously situated in the centre of the town of Yeovil; together with two Cottages adjoining the said garden in the possession of Job Cox and John Wheadon; the Shop is large and convenient, in a public and desirable situation, exhibiting a frontage of about 34 feet, and is well calculated for any business requiring room, particularly for that of the mercer and draper, which has been carried on upwards of a century in the same premises. - The purchaser may be accommodated with the counters, stock in trade, fixtures, and household goods, at a fair valuation. Apply for further particulars to Mr. Jennings, Mr. Lewis Beacham, or Mr. White, Attorney, Yeovil. In its edition of 24 February 1816 the Bristol Mirror's death notices recorded "At Evershot, Mr Gabriel Baker, formerly linen-draper of Yeovil." The painting above, shows Yeovil's first Post Office in High Street (replaced by Linsey Denner's shop in 1836, albeit not the present Beale's building), next door to the the Fleur-de-Lys Inn. The painting has been dated to between 1766 and 1780 based on notes on its back regarding the people depicted, including the Reverend Parsons who was vicar between these dates. In the doorway of the Fleur stands the landlord, Mr Boobier with Corporal Pope and in the ground floor inn window Mrs Boobier peeps out. At lower left of centre is depicted a post-boy with a whip and standing in the doorway of the Post Office is Postmaster Hobbs talking with Surgeon Rawlins, the Vicar of Yeovil Rev FC Parsons and Clerk Batten. At the upper window is Hobbs' servant 'Nanny'. While naive in style, the picture appears quite accurate in its detailing showing, for instance the Post Office's traditional graduated slate roof with heavier slates on the lower part of the roof, as is quite common in the area. The building itself is constructed in brick with a projecting ground floor with large shop windows. The notice of sale of Gabriel Baker's property - the Post Office in High Street - as advertised in the 8 June 1812 edition of the Salisbury & Winchester Journal.